ESPN is running a competition right now to name America’s best sports bar and while Third & Long didn’t make the cut, our neighbors to the South did. The season before Short Michelle and I started Dolfans NYC we visited Miami Mike’s in New Jersey for a game. It was amazing. 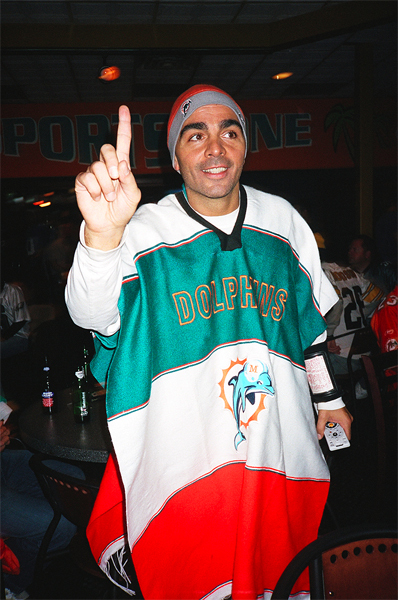 We watched the game with 100 Phins fans and they played the fight song after every score and Miami Mike ran around like a manaic with his Dolphins poncho on high fiving everyone. It was an amazing experience. So when Michelle and I started DolfansNYC Miami Mike’s was and continues to be a huge inspiration. 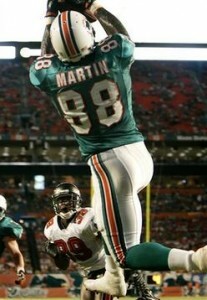 We will not stop until we are as big of a Dolphins home base as they are. With two huge Dolphins bars in Jets territory Dolfans will not be stopped. So if you guys would take a second and vote for our pals over at Miami Mike’s I would appreciate it. Let’s Go Dolphins! Ps. Yes, I am intentionally ignoring the preseason mess that just happened. According to multiple reports, the Dolphins have traded fan favorite Greg Camarillo toÂ the Minnesota Vikings, who wereÂ in desperate need of a wide receiver after losing Pro-Bowler Sidney Rice for the next eight weeks.Â Â A hard-worker and one of the most sure-handed players in the league, Camarillo will always be remembered for his 64-yard game-winning score from the immortal Cleo Lemon in Miami’s lone victoryÂ of theÂ 2007 season. In return, Miami will receive defensive back Benny Sapp, who’s started only 17 of 86 career games, recording 140 tackles, 4 interceptions, and six fumble recoveries.Â He’sÂ not likely to significantly help the Dolphins’ secondary, aside from adding a little depth and injury insurance while Will Allen recovers from knee surgery.Â Hell, 37-year-old Warren Sapp would’ve been a more exciting pick up, but alas. The bigger outcome, is thatÂ Patrick Turner, last year’s third-round pick, will now almost certainly make the final roster.Â Â Turner, whoÂ was active for only twoÂ games and failed to register a catch in 2009, wasn’t a lock to make the team going into training camp.Â Â While his sizeÂ (6’5″, 220 pounds)Â and athleticism make him a tough cover, the former USC standout had trouble grasping the fundamentals and getting off the line of scrimmage.Â Turner certainly didn’t help matters by missing time with a back injury and reportedly notÂ exhibitingÂ a strong work ethic or sense of urgency during training camp.Â He was evenÂ listed behind undrafted rookie Marlon Moore on Miami’s initial depth chart. But Turner has shown some notable improvement inÂ the first two preseason games,Â tyingÂ for the team-lead in catches (4) and ranking fourth in receiving yards (51)Â behind Anthony Fasano, Marshall, and Moore.Â Â At this point, he’s far more likely to make the team than Moore, as well as fellow undrafted rookies Julius Pruitt (3 catches for 31 yards)Â and Roberto Wallace (2 catches for 14 yards), if only because the Dolphins will be moreÂ reluctant to cut ties with a former high draft pick.Â Or two for that matter, with the all-but-inevitable release of 2009 second-round selection Pat White. The Dolphins won’t have to wait too long to find out how much Camarillo has left in the tank –Â Miami will travel toÂ Minnesota forÂ a Week 2 match-up on September 19. One of the staff writers over at PhinPhanatic, Chris Leeuw, recently broke his neck and is paralyzed from the neck down. Â This is obviously an horrible thing to happen to anyone, but having it happen to a member of our Dolphins family makes it even worse. 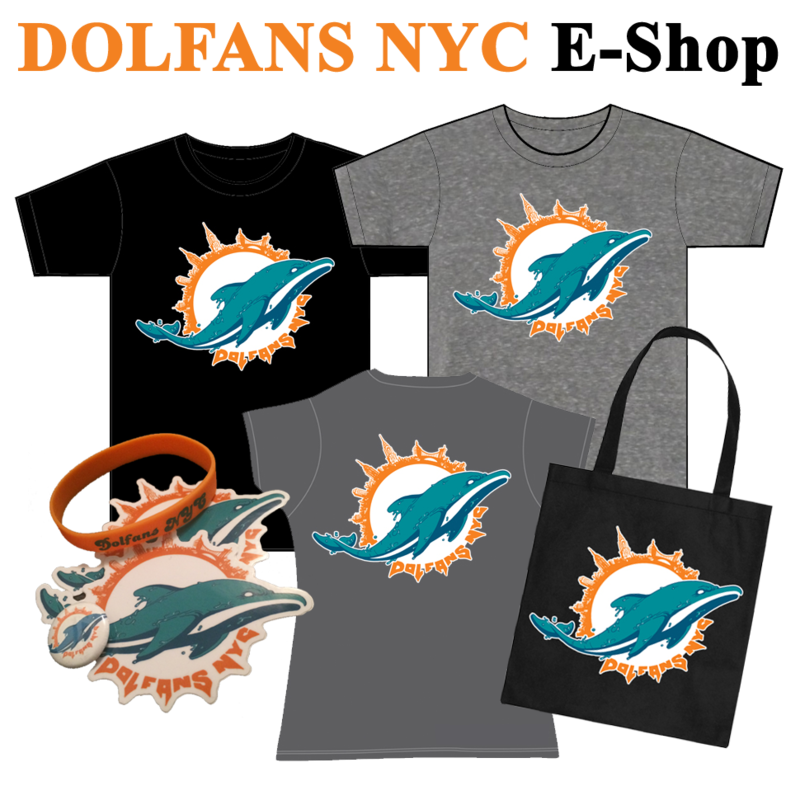 Our good friend Brian Millar over at PhinPhanatic reached out to us asking if we would post something on DolfansNYC asking our members to reach out to Chris and leave him a message of support. To follow Chris’ progress and to leave him a message of support click here. To find out more information about Chris and his injury click here. Let’s all hope he makes a full recovery! The addition of Brandon Marshall shouldÂ help open the run game for the Dolphins, who ranked fourth in the NFL in rushing yards in 2009 and sport a strong offensive line.Â The bigÂ question is whether Ronnie Brown, who’ll be motivated to earn a new contract, or the ageless Ricky Williams will reap the mostÂ benefits this season. Ronnie Brown, RB – Brown has been feast-or-famine over the last four years, capable of single-handedly winning any gameÂ or crushing your season.Â In 2006, he had his onlyÂ 1,000-yard rushing campaign (1,008 in 13 games), and in 2008, he made the Pro Bowl while amassing 1,170Â yards from scrimmageÂ and 10 rushing TDs (eighth in the league).Â But in 2007, BrownÂ suffered aÂ knee injury thatÂ cost him the final eight gamesÂ of the season, right asÂ he was leadingÂ the NFL in yards from scrimmage.Â Â Last year, heÂ was fourth in the league in rushing TDs (8)Â andÂ 11th in rushing yards until a Lisfranc fracture ended his season in Week 10.Â Consider that the last star running back who suffered a similar foot injury was Larry Johnson in 2007, who made the Pro Bowl the previous year butÂ hasn’t been the same sinceÂ (3.3 yards per carry in 2009). Hate him or love him, Brown has scored 5 TDs in 9 career games against the rival Jets. AÂ consensus second-round pick in 2009, Brown is being draftedÂ as the 22rd RB and 45th overall (10 spots ahead of Williams) in ESPN leagues.Â Â While he can no longer be counted upon as a number one RB, he’s a solid second back or flex option because he’s always a threat score out of the Wildcat.Â He could evenÂ end up beingÂ the steal of the draft if he can manage to stay healthy — the key word, of course, being “if.”Â Â As someone who’s been burnedÂ by Brown, who will turn 29 in December,Â on two occasions, I’m leaving him on the boardÂ for the bigger risk-takers anywhere beforeÂ the fifth round. Ricky Williams, RB – Last season, WilliamsÂ improbablyÂ rushed for 1,121 yards, setting an NFL record for longestÂ time-span between 1,000-yard seasons (6 years), and totaledÂ 13 TDs.Â Â With Brown out of the picture, heÂ averaged 99.8 rushing yards per game in Weeks 10 through 15 before getting slowed down by minor injuries.Â Yes, he’s 33 years old, but thanks to Ricky’s “extra-curricular activities,” he has onlyÂ 575 carries in the NFL over the last five years –Â about a third as many as Ladanian Thomlinson, Clinton Portis, Steven Jackson, and Thomas Jones. Still, expectations need to be held in check.Â In 2005 and 2008, his previous two full seasons, Williams had 168 and 160 carries, respectively, and isn’t likely to approach the 241 he had on a heavily run-oriented Dolphins teamÂ in 2009.Â Â He’s won’t reach 1,000 yardsÂ in what’s supposedly his final NFL season, but given Brown’s injury history, it’ll be impossible for MiamiÂ to not give Williams significant work all year long. It wouldn’t be a stretch to take Ricky as the first Dolphins RB off the board, and ahead far less consistent players such as Pierre Thomas, Matt Forte, and Joseph Addai. Patrick Cobbs, RB – Cobbs began the season as Miami’s third running back, but suffered a knee injury in Week 5 that cost him the rest of the season.Â In 2008, Cobbs averaged an impressive 7.3 yards per carry and caught 19 passes for 275 yards and two TDs, and is a deep sleeper in 2010 if he’s fully healthy.Â Cobbs could replace Pat White in Wildcat formations, giving him more scoring opportunities, and has even more value in leagues that count punt and kickoff returnÂ yards since he’ll see increased special teams work with Ted Ginn Jr. in San Francisco.Â Cobbs is worth a late-round flier, especially as a handcuff for owners of either Brown or Williams (or both). Lex Hilliard, RB -Â As Williams’ primary backup, HilliardÂ totaledÂ more than twice as many receiving yards (158) than rushing yards (89), catching a team-high nine passes for 74 yards in Week 16, and vultured a couple of goal-line TDs.Â Â But as the team’s number four RB, his role in the offense will be far too limited to justify a fantasy roster spot. Kory Sheets, RB – Both the Dolphins and your fantasy team are in serious trouble if they’re counting on fifth-stringer Sheets, who had one carry for five yards last season and should only be a factor on special teams in 2010. Coming soon:Â The biggest fantasy question of the year: which Dolphins’ Tight End is worth drafting as your team’s backup?